Epilepsy patients often had relatively longer expected survival after operations. To minimize surgical complications and wound discomforts could not only reduce the psychological impacts but also improve the postoperative quality of life. Selective amygdalohippocampectomy has been reported its efficacy in treating medically refractory temporal lobe epilepsy [1,2]. Although several different methods have been developed for selective amygdalohippocampectomy, including subtemporal [3-6], transsylvian [7,8], and transcortical approach [9-11], most of them often result in inaesthetic scars and profound damages to temporal muscle. Postoperatively, patients often encounter temporal muscle atrophy, occlusal pain or dysfunction, or inaesthetic facial contour. Subtemporal approach provides limited working space and requires vigorous brain retraction, which increase the risk of injury to the vein of Labbé and the temporal basal veins [3-6]. Transsylvian approach involves transection of the temporal stem and uncinate fasciculus and increases the risk of injury or vasospasm to the anterior circulation vasculature [7,8]. An ideal epilepsy surgery should reasonably balance operative outcomes, risk of collateral damage, safety, and ease of accessing a wider corridor to mesial structures. The non-epileptogenic functional lateral temporal neocortex should be spared to minimize postoperative neuropsychological dysfunction. By comparison, the transcortical approach involving a corticotomy of the middle temporal gyrus provides a safer approach to the mesial structures [10-13]. 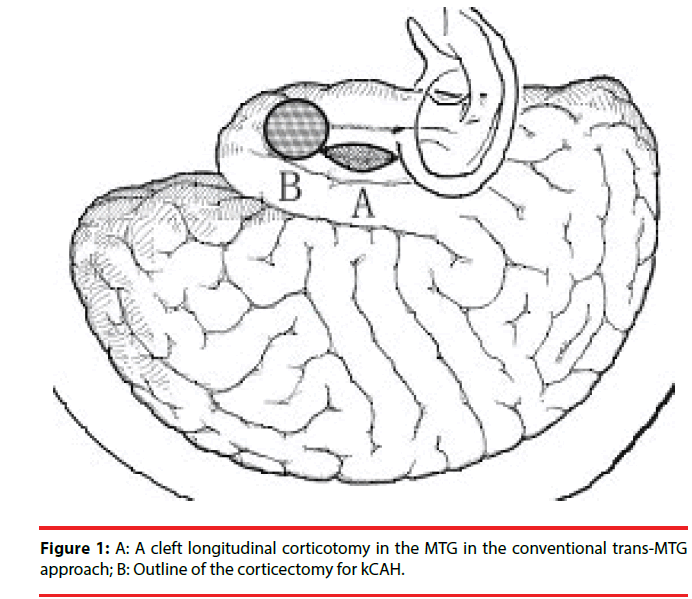 Keyhole corticoamygdalohippocampectomy (kCAH) is a modification of the trans-middle temporal gyrus approach with a more anterior corticectomy (Figure 1) with the aim of minimizing damage to the language area. Correspondingly, over the position of the corticectomy in the middle temporal gyrus, a keyhole anterior temporal craniotomy was devised and linear incision of skin and temporal musculature was made (Figure 2) . Figure 1: A: A cleft longitudinal corticotomy in the MTG in the conventional trans-MTG approach; B: Outline of the corticectomy for kCAH. 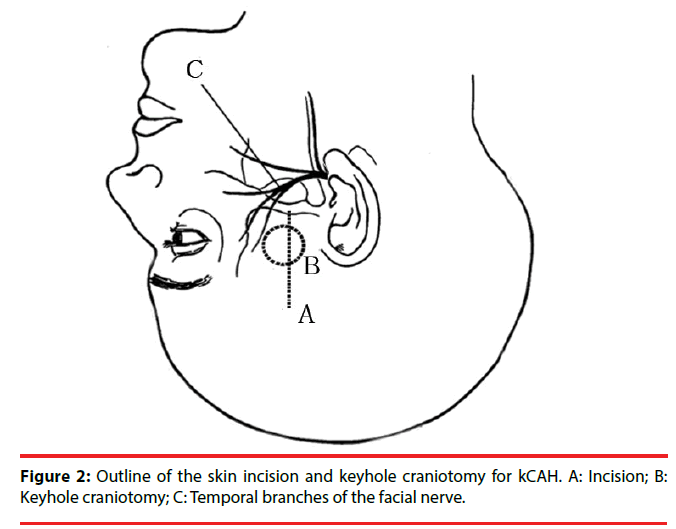 Figure 2: Outline of the skin incision and keyhole craniotomy for kCAH. A: Incision; B: Keyhole craniotomy; C: Temporal branches of the facial nerve. The procedure of kCAH begins with a vertical linear skin incision (6 cm in length) from the upper border of the zygomatic arch 2.5 cm anterior to the tragus toward the bregma (Figure 2). With guidance of the preoperative 3D magnetic resonance imaging (MRI), the position of the keyhole craniotomy is identified and a burr hole is made using a cranial drill and is enlarged to 2.5 cm in diameter using a Kerrison punch (Figure 3). The bone clast is collected for filling the empty spaces at the end of the operation (Figure 3). Once hemostasis is obtained, the dura is opened in a cruciate fashion. After exposing the temporal lobe, the middle temporal gyrus and the localization of corticectomy over the middle temporal gyrus can be identified with the aid of anatomical landmarks and 3DMRI scans. The corticectomy is generally circular with a diameter of 1.5 to 2.0 cm and is made at an area free of cortical vessels. The neocorticectomy is continued through the white matter of the middle and inferior temporal gyri, aiming sharply toward the floor of the middle fossa to reach the basal temporal sulcus, resect the anterior portion of the fusiform gyrus, and pass through the collateral sulcus or rhinal sulcus. In this way a cylinder-like corridor to the mesial temporal lobe is obtained. After identifying and opening of the tip of the temporal horn via a basal approach, the amygdala, uncus, and hippocampus-parahippocampal gyrus are resected through the anterior portion of the temporal horn (Figure 4) . Figure 3: Postoperative 3D-CT skull imaging showing the position of the keyhole craniotomy and bone clast filled in the empty spaces on the right side. Figure 4: Outline of the lower cylinder-like corticectomy through the anterior-most parts of the MTG and ITG. Left: Temporal basal surface; Right: Amygdalohippocampal cross section. An observational study included 683 patients who underwent kCAH for unilateral mesial temporal lobe epilepsy due to hippocampal sclerosis. After following for a median duration of 6.6 years (range, 2.1 to 10.3 years), it showed favorable surgical and neurological outcomes. The rate of Engel Class I seizure-free outcome was 87.0% (594/683) and the rate of Engel Class Ia was 72.2% (493/683; right 73.1% [274/375], left 71.1% [219/308]). No overt speech disturbance or visual field deficits were noted and no reoperation for retained mesial structures were indicated. Mean operation time was 1 hour 50 min (range, 1 hour 35 min to 2 hours 30 min) and mean blood loss was 50 ml per complete procedure. The duration of intensive care and hospitalization were also limited. There were no surgical mortality in this study, but 12 patients experienced complications (1.76 %): three patients experienced a superficial wound infection that was treated with oral antibiotics; one patient had a wound infection that required removal of the bone clast, debridement, intravenous treatment of antibiotics, and unnecessary delayed cranioplasty for its small size; two patients had rhinoliquorrhea after surgery and the liquorrhea ceased after temporary lumbar drainage in one patient and required treatment by temporal bone air cell repair operation in the other; one patient had a delayed contralateral subdural hematoma on routine postoperative cranial computed tomography which was clinically asymptomatic and was observed expectantly, and did not require reoperation as of last follow-up; one patient had a clinically silent lacunar stroke that did not require treatment; three patients had incomplete oculomotor palsies which resolved without sequelae; and one patient had ipsilateral mild frontalis muscle palsy which recovered during the 3-month follow . These favourable outcomes might reflect its strict selection criteria: (1) classic findings consistent with mesial temporal lobe epilepsy such as complex partial seizures; (2) epileptiform activity arising in the mesial temporal structures; (3) unilateral hippocampal atrophy with or without a T2 hyperintense signal; (4) ipsilateral temporal hypometabolism or asymmetries in temporal lobe metabolism . Because the most anterior portions of the middle and inferior temporal gyri are resected in advance, kCAH efficiently affords a wider, lower cylinderlike corridor and an opening to the temporal horn even without the assistance of neuronavigation. The risk of damages to the optic radiations and temporal stem can be minimized as the surrounding nonepileptogenic areas are not exposed. Mostly, the tip of temporal horn is approximately 3 cm below the posterior rim of the keyhole craniotomy. It still can easily identify the temporal horn even in patients with a small temporal horn. Preoperative careful planning by 3DMRI and MR venography are necessary to accurately locate the bony opening and temporal gyrus corticectomy, to guide the necessary trajectory for lesionectomy, and to preserve vascular structures. With guidance using the preoperative imaging, the location of keyhole craniotomy can be flexibly adjusted, but operational strategies remain the same. It is more convenient to access deep brain structures through a cylinder-like corridor than a cleft corridor. Limited surgical field does not affect the proper removal of epileptogenic foci. The size of the opening with keyhole craniotomy allows adequate visualization under microscope magnification for lesionectomy and maneuverability with microinstruments. Brainstem and surrounding neurovascular structures are protected and the risk of vascular insults is reduced by subpial resection of the mesial structures. Once the volume of resected tissue and intracranial dead space is minimized, the risk of postoperative hydrocephalus and intracranial infection can be reduced. Instead of spatula retraction, slim cottonoids and microsuction tube are used for minimal retraction to avoid risk of corridor constriction and risk of accidental brain injury by a spatula. There is no need to make the bone exposure down to the zygomatic arch. Thus, injuries to temporal muscle and facial nerve branches can be diminished and the risk of opening the air cells and postoperative occlusal problems can be reduced. The anterior lip of the scalp incision can be retracted more anteriorly by a fishhook to angle the microscope for a more posterior view of the hippocampus. The guidance of neuronavigation system is not required for kCAH. Therefore, medical cost can be hugely decreased, which is important for lowincome patients and for developing countries where neuronavigation is not available. Selective amygdalohippocampectomy usually demands a rather steep learning curve. The kCAH can shorten the learning curve for beginners if the assistance of neuronavigation is available. Although kCAH is not a minimally invasive technique, it is an easier, safer and less traumatic approach in comparison with conventional trans-middle temporal gyrus selective amygdalohippocampectomy. Additionally, it provides an attractive alternative for low-income patients in developing countries due to the feature of low medical cost. Elliott RE, Bollo RJ, Berliner JL, et al. Anterior temporal lobectomy with amygdalohippocampectomy for mesial temporal sclerosis: predictors of long-term seizure control. J. Neurosurg 119(2), 261-272 (2013). Hori T, Kondo S, Takenobu A, et al. Retrolabyrinthine presigmoid transpetrosal approach for selective subtemporal amygdalohippocampectomy. Neurol. Med. Chir (Tokyo) 39(3), 214-224 (1999). Hori T, Tabuchi S, Kurosaki M, et al. Subtemporal amygdalohippocampectomy for treating medically intractable temporal lobe epilepsy. Neurosurgery 33(1), 50-56 (1993). Hori T, Yamane F, Ochiai T, et al. Selective subtemporal amygdalohippocampectomy for refractory temporal lobe epilepsy: operative and neuropsychological outcomes. J. Neurosurg 106(1), 134-141 (2007). Yang PF, Zhang HJ, Pei JS, et al. Neuropsychological outcomes of subtemporal selective amygdalohippocampectomy via a small craniotomy. J. Neurosurg 125(1), 67-74 (2016). Wieser HG, Yasargil MG. Selective amygdalohippocampectomy as a surgical treatment of mesiobasal limbic epilepsy. Surg. Neurol 17(6), 445-457 (1982). Yasargil MG, Krayenbühl N, Roth P, et al. The selective amygdalohippocampectomy for intractable temporal limbic seizures. J. Neurosurg 112(1), 168-185 (2010). Acar G, Acar F, Miller J, et al. Seizure outcome following transcortical selective amygdalohippocampectomy in mesial temporal lobe epilepsy. Stereotact. Funct. Neurosurg 86(5), 314-319 (2008). Boling W. Minimal access keyhole surgery for mesial temporal lobe epilepsy. J. Clin. Neurosci 17(9), 1180-1184 (2010). Wheatley BM. Selective amygdalohippocampectomy: the trans-middle temporal gyrus approach. Neurosurg. Focus 25(3), E4 (2008). Spencer D, Burchiel K. Selective amygdalohippocampectomy. Epilepsy. Res. Treat 2012(1), 382095 (2012). Tanriverdi T, Olivier A, Poulin N, et al. Long-term seizure outcome after mesial temporal lobe epilepsy surgery: corticalamygdalohippocampectomy versus selective amygdalohippocampectomy. J. Neurosurg 108(3), 517-524 (2008). Yang PF, Zhang HJ, Pei JS, et al. Keyhole epilepsy surgery: corticoamygdalohippocampectomy for mesial temporal sclerosis. Neurosurg. Rev 39(1), 99-108 (2016).